Considered by many to be the most important meal of the day, breakfast also happens to be my absolute FAVORITE meal of the day. Fresh fruit plus some type of grains is pretty much a morning staple for me. 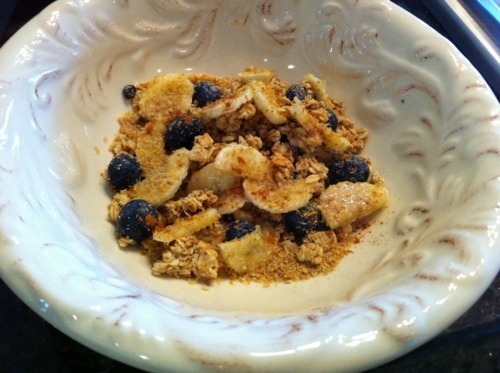 And whether in oatmeal or granola, blueberries make an excellent addition to nearly any AM meal. Not only are they delicious, but they are also brimming with antioxidant goodness…(and considering that I just turned another year older a few weeks back, I’ll take as many age-fighting antioxidants as I can get). 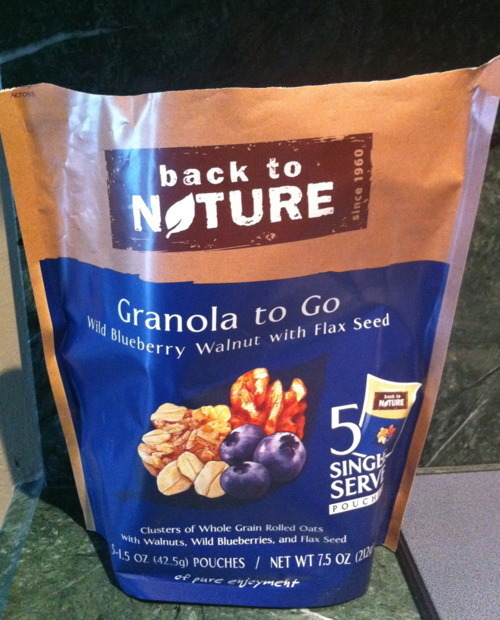 So when I found these blueberry-walnut with flax granola packets from Back to Nature in stores not long ago, I had to give them a try. The single-serve packs are good for on-the-go, or portion control. I combined one of the pouches in a bowl with fresh blueberries and banana slices, and drizzled a little almond milk on top. I also added a little cinnamon and nutmeg. ← Some Like It Hot.